Holy One, breath of life, source of all that is sacred, creative, resistant, breathe into us here and now. Make of our Lenten journeys a bold-enough embodiment that is worthy of you. Amen. In the summer of 1991, it was bugging me that gay and AIDS activists had largely left him alone. We had a heavy portable generator, a long extension cord, two ladders, rubber mallets, plastic stakes, one of those early clunky cell phones, a small cold-air blower for the ground, and a large blower with a custom-built stand for the roof. The condom was made of parachute material. We unfurled it on the roof, connected it to the blower, and prayed the cops took at least five minutes to get there. As it began to rise, all the guy wires were quickly staked into the lawn on all four sides of the house. This story of Peter Staley and other AIDS Coalition To Unlease Power (ACT UP) activists kept coming to me as I read our scripture from John’s gospel. Let me explain. In our gospel for this morning, Jesus is faced with an economic system that is crushing people. Every Jew was required to make a yearly Passover pilgrimage to the Temple in Jerusalem and to make a sacrifice there. But the system was set up such that you couldn’t bring your own animals with you and you couldn’t use any money that had the picture of the Emperor on it to buy anything for sacrifice. So you had poor Jews coming to the Temple with their currency that had to be exchanged through the money changers and then they had to buy an animal to offer in sacrifice. Both the money changers and the sellers of animals knew they had people and they engaged in exploitive price-gauging. And Jesus is furious about this morass of economic and spiritual abuse. On Sept 5, 1991 as Peter Staley was inflating the giant condom over Jesse Helm’s house, I was a twenty-two year old working as an AIDS-buddy in Seattle. I had only just moved there after graduating from college and I’d been out as a lesbian for a little over a year. AIDS had devastated a whole generation of gay men and there was absolutely no cure. The reality of being young and queer and being surrounded by so much death and fear was a shocking juxtaposition. The fact that Staley and others looked into the face of fear and death and took creative, bold action is inspiring to me. And I think it is the kind of action of which Jesus would approve—indeed I think it is the kind of action to which Jesus invites us in our Scripture for today. There is one more interesting piece about our Scripture that seems important. This story of Jesus’ turning over the tables, of disrupting the economic and religious system, is found in all four gospels. In Matthew, Mark and Luke, it is one of the last acts Jesus does before he is arrested. It is a kind of last-straw for the authorities. It is the culmination of Jesus’ ministry—his ultimate confrontation with the Powers that ultimately gets him killed. But in John’s gospel, which we read from today, it is at the beginning, in chapter 2. In John’s gospel, it is one of the first things that Jesus does and it is hugely symbolic of who he is and what his ministry is about. But in both John’s account and in the other gospel writers, regardless of where the story is found, the reason that Jesus disrupts, overturns, causes a riot and chaos isn’t because the disruption is the point. He screams NO because the way things are going is a clear perversion of how God has created the world to be. In place of the belovedness and goodness of all of creation declared in Genesis, people are treated as worthless. In place of a web of life connecting stars and planets and all the company of creation with the flutter of butterfly wings and the breath of each person, money changers and animal sellers are actively severing the connections of beloved community. 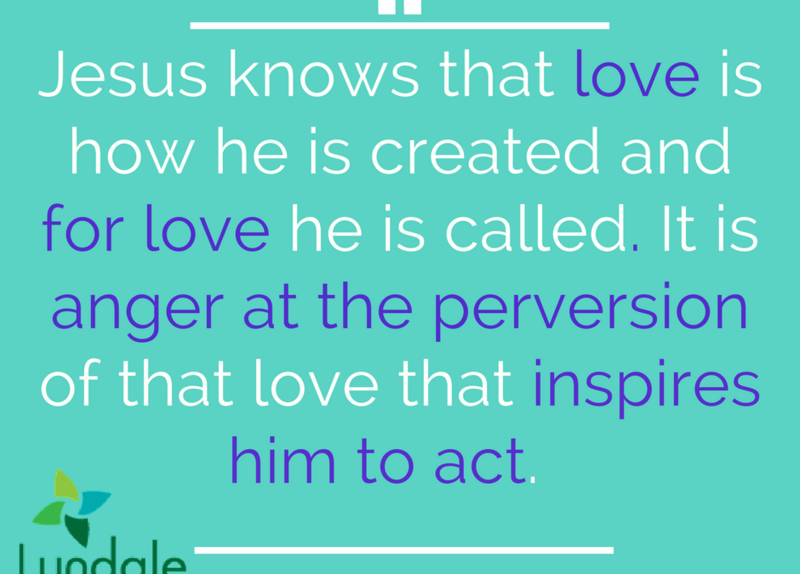 Jesus knows that love is how he is created and for love he is called. It is anger at the perversion of that love that inspires him to act. He reads the situation and understands the particular distortion of love and responds directly to that. In other parts of the gospel, he takes different actions—healing those whom society deem outcast, eating with those considered unclean, listening and talking with those considered sexual pariahs. So it is not to suggest that turning over tables and inflating giant condoms are the only faithful actions. Disruption is not the only way to follow in Jesus path. But, especially in this day, when the belovedness of every human being is constantly under attack… when our President calls some of God’s children “snakes” as he stokes the fire of supremacy, for example… and when the web of the interconnected of life is hack-sawed by the perversion of vile hatreds like Charlottesville and ICE raids and the threatened deportation of DREAMERS that could start tomorrow… Jesus reminds us that weaving a whip of cords and turning over tables and renting a Uhaul and a heavy portable generator, and a long extension cord, and two ladders, and rubber mallets, and plastic stakes, and one of those early clunky cell phones, and a small cold-air blower for the ground and inflating a giant condom… all to say NO… Jesus reminds us that these, too, are the work of God in the world. My friends, we, too, know how to do this. Now let’s get to work.